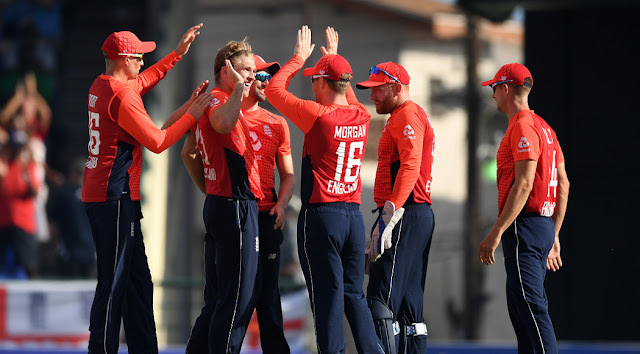 England ended their Caribbean tour on an upbeat note when they thrashed West Indies by eight wickets in the final Twenty20 international on Sunday to sweep the three-match series. Fast-medium bowler David Willey rattled through the West Indies' top order, taking 4-7 off three overs as England dismissed the home team for a paltry 71 in 13 overs at Basseterre in Saint Kitts and Nevis. The capitulation left West Indies with the ignominy of being the first team to score less than 75 in consecutive T20 internationals, following their 45-run total in the second game on Friday. No West Indies batsman scored more than 11. It took England just 10.3 overs to polish off their victory target, Jonny Bairstow scoring a quickfire 37. The dye was cast from the first ball on a slowish wicket when Shai Hope gave an easy catch to short cover off Willey, who was named man-of-the-match. "My role up front there is to try to swing the new ball," Willey said. "Tonight it didn't swing a great deal but I put it in the right area and there was a bit of hold in the pitch for me and it forced some errors from the West Indies." Captain Eoin Morgan was particularly pleased with the performance of some of his fringe players who got a chance to play when several first-choice players were rested. "Guys who don't get a huge amount of opportunities have stuck their hand up on numerous occasions and it's really exciting to see," Morgan said, naming bowlers Willey and Chris Jordan and batsmen Sam Billings and Joe Denly. West Indies captain Jason Holder said his team needed to learn to adjust to the batting conditions. "If conditions aren't true in terms of the ball coming onto the bat we've got to adapt and set it up for our middle and lower (order) in the back half of the innings," he said. England return home having improved as their tour progressed. They lost the Test series 2-1 then drew the one-dayers 2-2 before sweeping the Twenty20 matches.